Concordia is a medium weight strategic board game which combines elements of resource management, economic development, hand management and a tiny bit of deck building. It plays two to five players in a couple of hours and retails for under £40. Its not cheap, but on the bright side it’s a beautiful game. 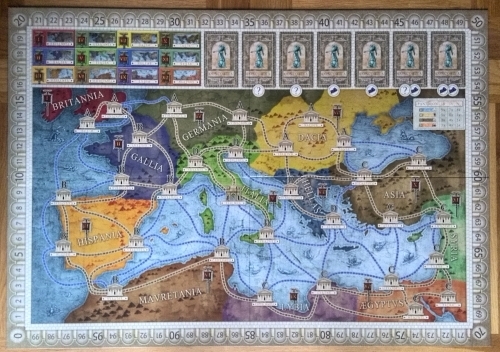 It plays out in Roman times on a lovely map of the Med (or just Italy on the flip-side if you’re playing with a lower player count) which is broken down into smaller zones. The massive box also contains a bunch of custom wooden cubes (including cute little anvils! ), well designed good quality cards, a plethora of cardboard chits and a beautifully clear rulebook. In fact, throughout this box is a level of attention to detail that puts most other game publishers to shame. As is often the case with games from PD-Verlag you get an extra pamphlet with historic information about all the countries in the region in this period; as well as a really useful setup card in both English and German (the box actually includes two packs of cards, one in each language). Designer Mac Gerdts has become known for his board game rondel; a system of taking actions he employed in his last five or six games and one I’ve really enjoyed (I borrowed heavily from it for The Empire Engine). But in a surprise this game is rondel-less, instead employing cards for players to use to make action choices. Each player starts with an identical hand of eight action cards, six colonists (two on the map), six goods, 15 Monopoly houses (AKA settlements) plus some cash. Your aim is to use these resources and action cards to spread your colonists across the map, leaving settlements along the way. You will also pick up extra action cards along the way; when someone buys the last available action card, or places their last settlement, the game ends – and (surprise) the person who scores the most points wins. In essence, this game is pretty simple: discard an action card, do the action, finish your turn – rinse and repeat. The actions all make thematic sense too; move/settle, trade goods, produce resources (you randomly seed each area with a product before play), draft action cards and pass (where you put all discarded cards back into your hand). There’s lots of other little details, but that’s the meat. All the cards explain on them what they do, so that should help – but oddly it can make things worse. As the game goes on you pick up more cards and your settlements start to spread, giving you a handful of cards full of small text and a board full of wooden chits – as well as money and resources to juggle on your player board. For some, it can certainly become a little overwhelming and icons may well have helped. Then there’s the endgame scoring. It’s a simple and ingenious system, but to score well adds another level of decision making; basically, this is a game that’s pretty easy to play badly and something else entirely to feel you’ve got a good grasp of. Every action card is also associated with a god – and each god scores differently at the end of the game. For each card of a certain god you have, you’ll multiply that score by one – it might be cities built, colonists placed, zones settled etc. So when you draft extra action cards you’re not only thinking about getting an extra action, you’re also thinking about what it will do to your score – and so your future actions. Overall I’ve actually found the game one of the easier ones to teach. Everyone starts with the same cards, so you can walk through those before you start. Also each turn is just one action, so people will soon see all the actions happen on the board. And thankfully there’s a variant in the rules for new players which walks you through the scoring quite early in the game; I’d certainly recommend using it – a fabulous innovation. The writer: As a Mac Gerdts/rondel fan I was a little sad when I heard this had a new card mechanism instead, but I needn’t have worried. Despite being sans rondel, it still feels like a Gerdts game; epic board, awesome components, snappy turns, deep strategy and tough decisions. My concern is replayability, as at the base level there’s not much variation, but several games in it’s yet to be a factor. The thinker: Concordia is a joy to play. After initial setup (which has several random elements, increasing replayability) there’s very little randomness or direct player interaction. You can form a plan and follow it to the letter, but a good player will react when opportunity presents itself in the actions of other players – making this a perfect blend of strategy and tactics. The trasher: I started out enjoying this; getting my guys out on the board and building my empire. But unfortunately that’s all you do; no conflict, no powers, hardly any uniqueness (there are some unique cards to draft in, but they’re just another way to produce/score) and plenty head scratching late on. I didn’t hate it, but its not a game I’ll be rushing to play again. The dabbler: Concordia surprised me a little. At times I found the decisions to be a little overwhelming, but it was still fun and simple to pick up. And while I didn’t trouble the leaders as much as I’d hoped, playing was a thoroughly satisfying experience and I actually found it pretty relaxing – despite being perplexing at times. The great components and short turns certainly help! A small but but notable criticism has been there’s a little too much room on the board. This makes an already passive game even less toothless, as one of the few ways to make people suffer is to settle places you know they want to go. This is because, as in Power Grid, it’s more expensive to settle where someone has built already. But with such an expansive board, often being third into an area isn’t much of a hardship. Another possible issue already alluded to is replayability. While Concordia goes to great lengths to randomise everything it can while still staying stoically strategic, you can’t get away from the fact you are changing resources into victory points on a map of the Mediterranean. Five resources in custom shapes does not a theme make; we’re in standard euro territory here – which brings us nicely to the final talking point. It’s not a great reach to then label Concordia emotionless, dry, puzzly, mathsy or mechanical. Is it fair to do so? Possibly. Does it matter? Well, that depends on your opinion of what makes a good game. There are no dice in the box – and no spaceships. It’s unlikely that, at any point, you’ll find people standing over the table with baited breath. But to me this doesn’t sound like criticism of Concordia, it sounds like criticism of a genre – and Concordia is nothing if not a fine example of a classic euro game. 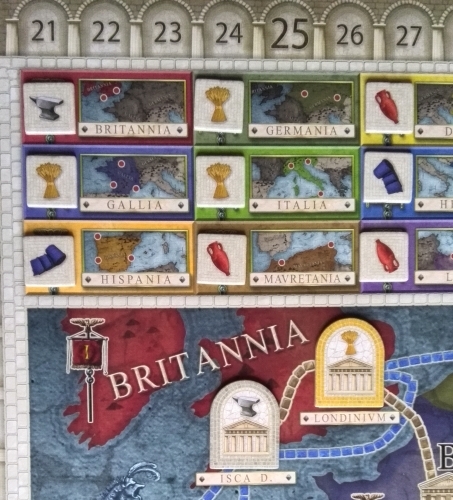 Luckily for me, I love a classic euro game – and consequently so far rate Concordia an 8.5. I’ve really enjoyed each game I’ve played to date, regardless of player number (two to four for me), and feel I’ve got plenty to get from the game in the future. But the game seems to have taken a bit of a dip in fortunes since gaining a head of steam at Essen in October 2013. It was one of the real buzz titles during the show, and has gained some fantastic reviews, but the heavy hitters of the podcast and writing worlds collectively failed to include it in their end of year ‘top 10’ lists. In some respects, I think this says much about the quality of strategy games that came out in 2013: it seemed something of a vintage year, especially with some of the really good 2012 games only getting good distribution this year too (the clearest example being Terra Mystica). It doesn’t help that PD-Verlag is a small player, especially on the US scene where most of the English speaking board game press seems to emanate from. But hopefully people will continue to discover Concordia, and with it both PD-Verlag and Mac Gerdts. It’s a fantastic game from a great company and clever designer; a rare example of a clever and beautiful strategy game that has a much lower barrier to entry than you might normally expect. 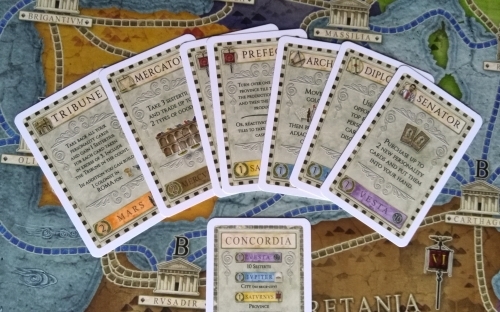 This entry was posted in Board games, Games and tagged board game, Board game review, board games, boardgame review, Concordia, Concordia review by Chris Marling. Bookmark the permalink. I think I know someone who will be including it in their top ten. I’m more in line with the Trasher though I hate it a bit more than that. There’s nothing special here to grab me, it takes too long to play despite the simple rules when people AP over point optimization and if your cards get bought before you can get them, you are out of the game. Hmm. Not had a problem with people AP-ing with Concordia – not any more than in other medium weight euros anyway. As for not getting the right cards, would totally disagree – sure there’s a tactical element but if you build a strategy relying on getting specific cards, surely that’s bad play? You should always be able to adapt your position.